2017 May » Welcome to vSphere-land! 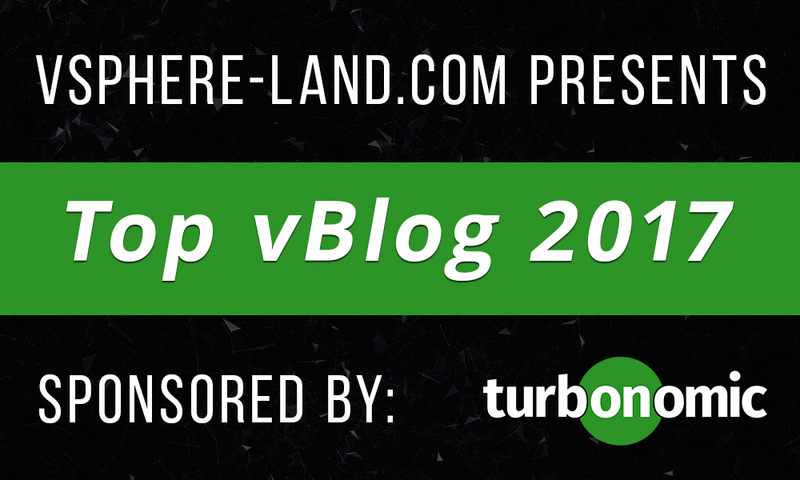 After a huge amount of effort finding and migrating to a new survey platform (and briefly breaking it with the sheer size of this survey), voting for Top vBlog 2017 is now open! The number of blogs devoted to VMware and virtualization continues to stay at an amazingly high level, this year there are almost 300 of them on the ballot. 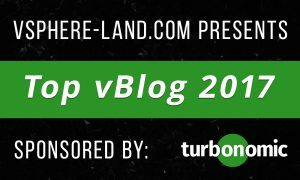 Here’s your chance to show your appreciation to the bloggers for all their hard work by picking your favorites which will determine the Top vBlogs for 2017. Last year over 1,600 people voted from all over the world and when the votes were tallied the top 50 bloggers were revealed. Now it’s time to do it all over again as new blogs are born and old blogs fade away and bloggers move up and down the rankings. When casting your votes please keep the following in mind about the blogs. Again this year you can pick 12 of your favorite blogs and then rank them in your order of preference. The results will be weighted with a #1 ranking getting 12 points and a #12 ranking getting 1 point. Point totals will be tabulated and from them the top 50 will be determined. Note that blogs that did not have at least 10 posts in 2016 are not eligible to participate and not listed (Alan Renouf #9 was one of those). Also note that Duncan Epping (Yellow Bricks) #1 and Frank Denneman #4 chose not to participate this year which should make for a whole different top 10. Again this year we also having voting in special categories to help distinguish certain types of blogs. The choices of which blogs to include in the categories was the result of this survey and my best guessing. The categories are independent of the general voting so first pick and rank your top 12 overall favorite blogs and then choose your favorite blog in each category. Voting will run until 6/30, afterwards the results will be determined and announced on a special live podcast with myself, John Troyer and a special guest from Turbonomic. New this year bloggers who make the Top 50 will get a nice commemorative pin that they can wear anywhere to proudly display their accomplishment. The pin will be fairly similar to the coin designs of past but is obviously one-sided as it is meant to be worn on clothing. Of course all this is made possible by Turbonomic who is the official sponsor for Top vBlog 2017!